When I first decided to really focus on the Overholt side of my family tree, the tree filled up pretty quickly as a result of others research. But, being the person that I am, I wanted my own proof. So, I set out to find it, hoping to discover a Revolutionary War ancestor along the way. Starting with my Grandfather, who is still living, I was able to find out stuff about his father, Arnold Overholt, in Pennsylvania. Then I was able to find his father, James Wesley Overholt. I am so interested in this man! I absolutely love the name Wesley and love the name James Wesley even more. That was really the only reason for a long time until one day I discovered James was missing a “Z”! Apparently, the family story is James became disgusted with his family and didn’t want to be associated with them so he changed his last name from Overholtz to Overholt. Well, now James, what happened? James is the second born to Edward Overholtz and Elizabeth (possibly Elizabeth R.R. Brown). Edward is the second born to Samuel and Catherine Hinkel Overholser. I believe Edward was born in Shenandoah County, Virginia around 1832. My first evidence of Edward is the 1850 Census in Shenandoah County, Virginia. He is an 18 year old man in his parents house. He’s a shoemaker along with his older brother, Anderson! When Edward next appears he is in the 1860 Census, this time in Greenbrier County, Virginia (now West Virginia). He is married to Elizabeth and they have had their first child, John C. They are listed as Overheels. Hmm, must have been the Virginia drawl mixed with the German. Why they are over there I have yet to answer. His listed occupation is a miller. Busy as Edward and Elizabeth were I don’t find them again until the 1870 Census. This time they are in Spencer, Allen County, Ohio. And, they are Overhulser’s. They have their family, as I have always known it to be, and are in Ohio where a lot of extended family has been for some time. Edward is now a carpenter. From the 1870 census record, I can assume James Wesley (child #2) was born while they were still in Greenbrier County (once Virginia but became West Virginia in 1861). That means sometime after 11 July 1861, they moved back to Virginia so William could be born in 1863. Then they made the move to Ohio sometime after 1863 but before 1867, when Annie was born. I would suppose they were moving because of the Civil War. I find no record of Edward serving and he was creating children during the war. I can’t imagine he’d be running back home to make a baby and then returning to the battlefield! If the marriage record below is correct, then 1873 is the last known record of Edward and Elizabeth. This record was obtained from the records in Lima, Allen County, Ohio in 2004. 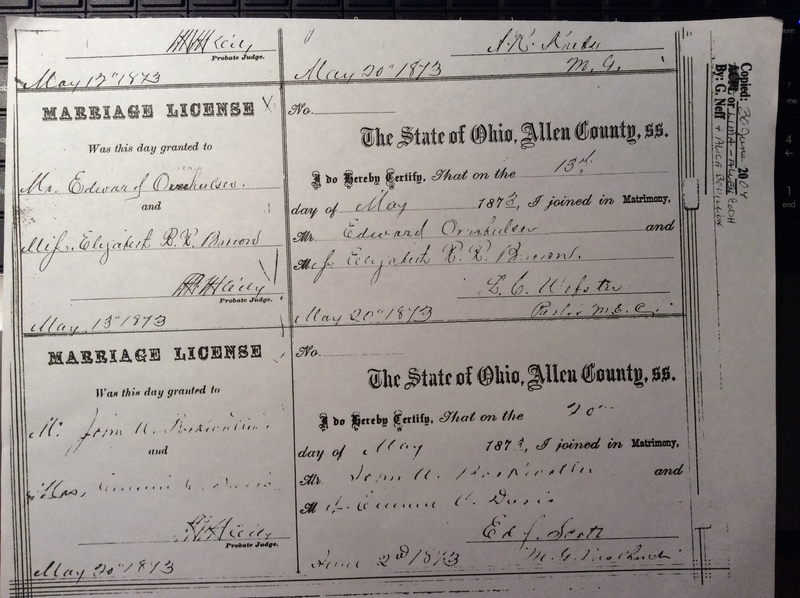 It shows an Edward Overhulser marrying an Elizabeth R.R. Brown. The marriage occurred on the 20th of May 1873. I contacted Lima Trinity United Methodist Church, the current church where L.C. Webster was Pastor, they confirmed the date of the marriage and the names. They had no other information. So, it is not confirmed in my mind these are the same two people. If it is them, the marriage occurred about 6 years after their last child was born and 13 years after they first appeared together. However, a common law marriage may have not been acceptable when arriving in Ohio where Edward’s younger brother, Samuel Peter Overholtz, was a minister. There is no record in Virginia of their marriage. Marriage License of an Edward Overhulser and Elizabeth R. R. Brown on 13 May 1873 in Allen County, Ohio. I have traced all of their children, except Annie. The 1870 Census record is the only record I have found as of this writing that provides evidence of Annie. Where my search originally started with Edward, it now includes Elizabeth, his wife, and Annie, his daughter. I can’t find any evidence of death or burial, so if you meet them give them my contact info!